Comment There are 44 more comments, click here to view them. I cant wait to see peoples bases!!! Screen shot them bases people! I guess Ill go first, theres always room for improvment right? What should I change with my layout. I guess ill calm down on upgrading town hall. My townhall is lvl 9 right now air def. is @ lvl 3and4, sniper tower @ lvl13, mage tower @ lvl4, canon @ lvl14, mortar @lvl 6, victory stat. lvl 5, ermah @ lvl 1, reaper @lvl 1. I thought that was alright lol. 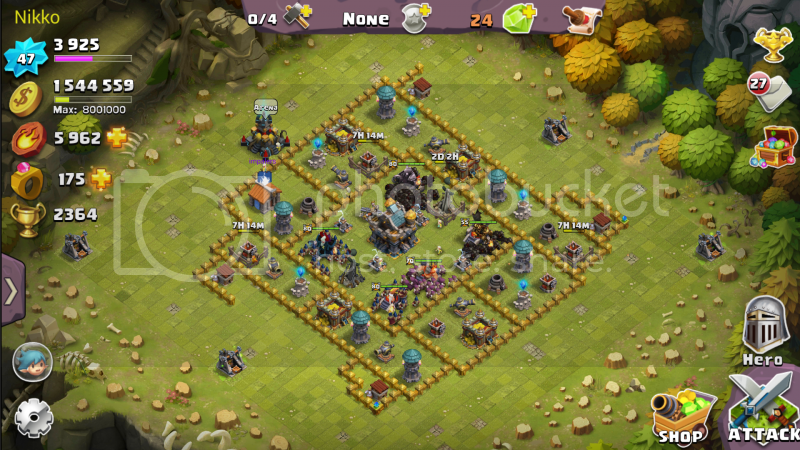 What level should my defense be at? No problem, I guess ill just be patient and upgrade to the max before upgrading TH. Thanks bro!